To me, you can’t get better than a warm, jelly filled Bismark doughnut. I love them. It’s a really good thing there is not a doughnut shop on my normal driving route because raspberry Bismarks are one of the foods I cannot resist. Really. Anybody wants to capture me and torture me for information – use a fresh Top Pot Raspberry Bismark as a reward for talking. I found a recipe today that I couldn’t wait to make – my favorite doughnut, turned into a muffin. How dee-lightful! I doubled the basic recipe because it said it only made 10, which is way not enough for my small group. Messed with the spices a little and made half with raspberry jam (topped with the cinnamon/sugar) and half with lemon curd (topped with powdered sugar…still brushed with butter first). These are a perfect alternative to my favorite doughnut. Fantastic! Sometimes, you just want a doughnut. If you’re like me, you have trouble justifying the drive to a bakery just to buy one, so you get a dozen. And then eat them all. Not good. Here’s my take on a mini-muffin that tastes just like a delicious doughnut. Without the guilt. The original recipe for this used butter, I like to substitute applesauce wherever I can – and always have success when using it in muffins or bread. These are light and delicious. Bet you can’t eat just one! I’m glad I’m heading out of the house – otherwise there’s no way these would make it to the meeting I’m taking them to tonight! 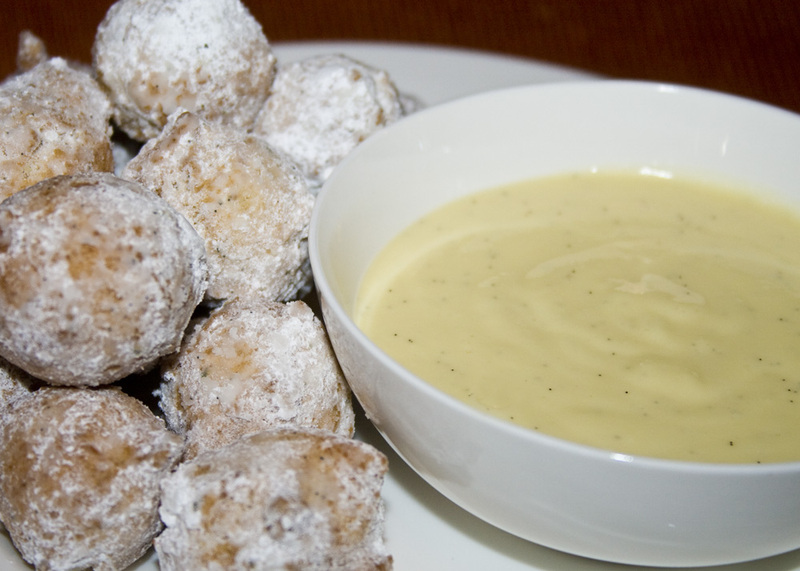 When I made my Applesauce Drop Doughnuts the other day, I felt it was missing something. 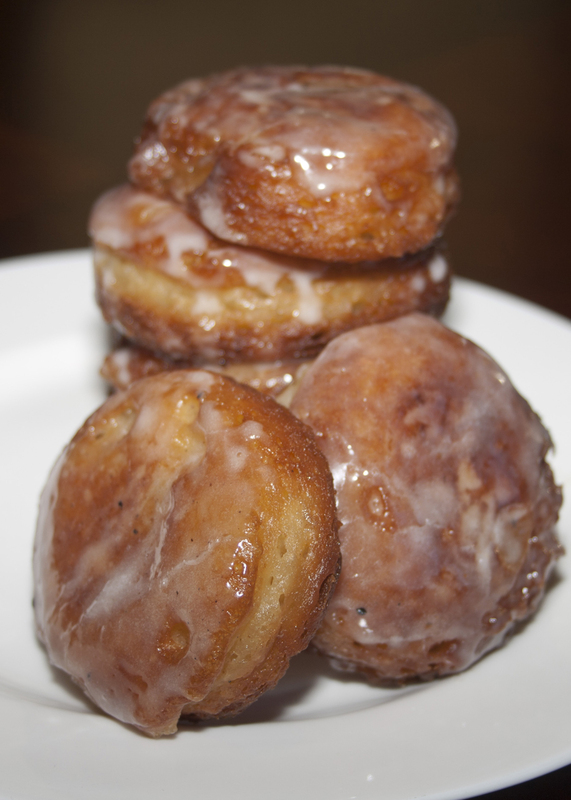 I found this recipe from pastry chef Amy Foster of Tallula, and decided it would perfectly complement the fluffy doughnuts. I added vanilla bean innards to mine, which gives it the beautiful specks of black. I took the remaining innards and the hull of the vanilla bean and added them to some powdered sugar in a ziplock bag for coating this batch of doughnuts. I made these tonight for our annual family trick-or-treating extravaganza. They were crispy on the outside and warm and soft on the inside. They were awesome! Next time, I’ll make some kind of dipping sauce (raspberry maybe, or possibly a vanilla bean custard) and try rolling them in powdered sugar. I think that would make them absolutely perfect. I also would like to try these substituting pumpkin for the applesauce and kicking up the spices a little. 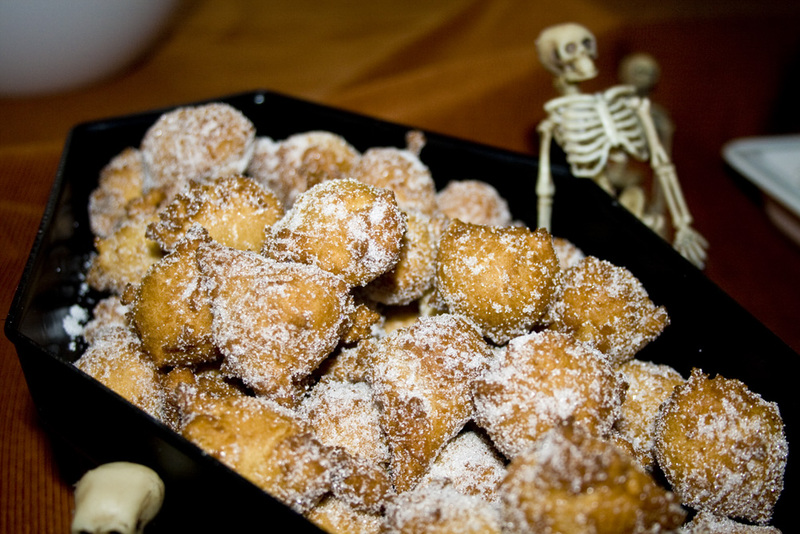 Mmmmm, I really do love pumpkin spice things.This recipe makes a TON of little doughnut holes. They disappear quickly though, this whole batch was gone before I knew it! Luckily, we had lots of other food, including Simple Caramel Apples, Wassail, Mom’s Tortellini Soup, and Pumpkin Spice Cupcakes with Cream Cheese Frosting.